Marcos da Silva, Mestre Barrão was born in the port city of Recife, on the North East coast of Brazil. Recife is renowned for its Brazilian music and dance, and its long Capoeira tradition. In 1974, Marcos began studying Capoeira with Mestre Pirajá. While learning the foundations of the art, he showed an affinity for the drums and other instruments as well as the skills that would conduct his life. After three years of training with Mestre Pirajá, who eventually left on sabbatical, Marcos went on in 1977 to continue his training with Mestre Teté. Mestre Teté shared with him the ways of the Street Capoeirista. He learned about the variable situations of the street: how to be shrewd and clever when playing, how to read opponents, and how to judge situations that one invariably finds oneself in, both inside and outside of the Roda of Capoeira. In 1979, he began to enter Capoeira competitions throughout North East Brazil and in 1980, Marcos began to teach. In 1982, a young Barrão was determined to test his skills against the best opponents he could find and entered the prestigious National Championship in Rio de Janeiro. Such was his skill and fortune that in the end, he left as Brazilian Champion. Upon his return, many opportunities came his way to teach in schools, community centres, and universities throughout Brazil and eventually he formed Grupo Axé Capoeira. In 1987, he was graduated to First Degree Master by Mestre Pirajá. He has now received his Second Degree Master. In 1990, Mestre Barrão was invited to demonstrate his art at the International Children’s Festivals throughout North America and eventually found himself in Canada at the Vancouver International Children’s Festival. After spending 1991 teaching in Italy, Barrão decided to immigrate to Canada in 1992 and begin teaching here at various locations. He started The Annual International Capoeira Encounter and has renowned and respected Mestres from all over the world visit and share their skills. In 1996, he opened Canada’s first Academy of Capoeira. Today, Mestre Barrão frequently receives invitations to conduct and teach Capoeira at international workshops. The mestres who assembled at the Melhores Do Seculo event in Curitiba Parana in 2000, recognized Mestre Barrão as one of the great capoeiristas of the century, due to his skill and contribution to Capoeira. 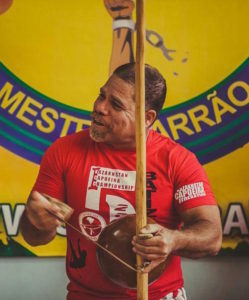 Mestre Barrão and his Grupo Axé Capoeira have recorded 8 CD volumes of Capoeira music and one other, together with Mestre Burguês which continues to be tremendously popular throughout Brazil. They have also released Axé Capoeira 2000, a video of the 2000 International Encounter as well as Axé Capoeira Performance Videos – Brazil 2001, Brazil 2003, & Brazil 2005. Mestre Barrão now has schools in Canada, Brazil, United States, Mexico, Colombia, Peru, Russia, China, Trinidad & Tobago, Kazakhstan, Ukraine, Serbia, Azerbaijan, France, UK, Czech Republic, Angola, Turkey, Japan, Barbados, Belarus, Dominican Republic, and Poland.